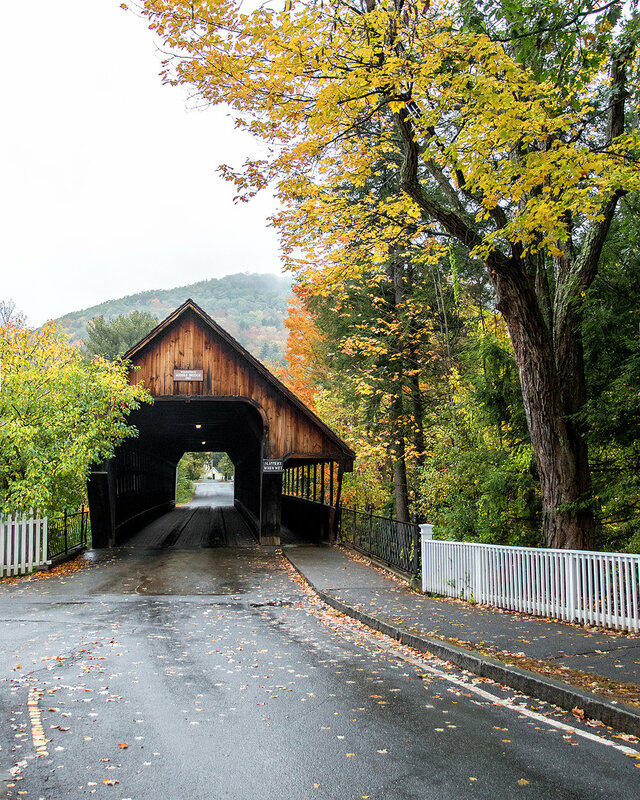 I had the first weekend of October open so I decided to head north to the scenic Route 100 Byway of south-central Vermont. 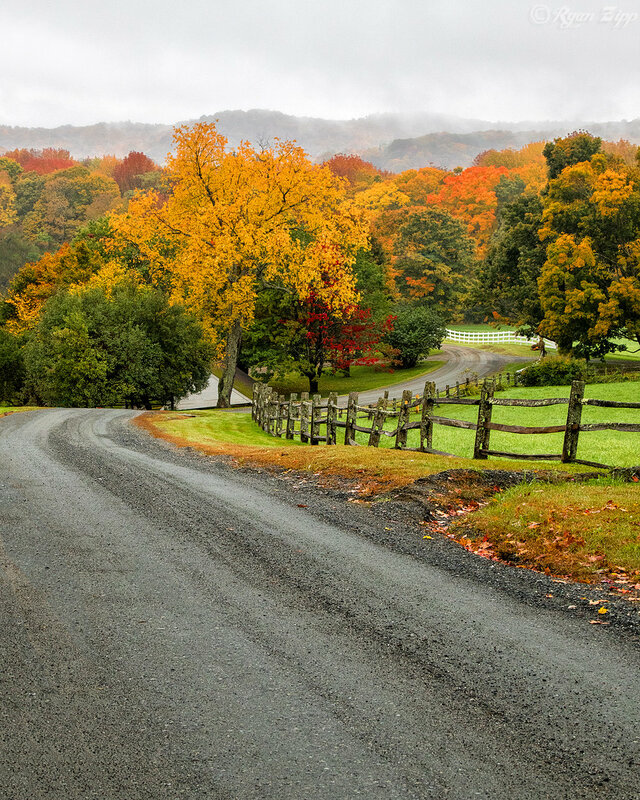 With peak Fall colors kicking in it was the perfect time to to cruise what is often referred to as one of the most scenic drives in New England. My first stop was just about 20 miles over the state line in the area around Mount Snow ski area. Surprisingly a good chunk of the trees in this spot appeared to be already past peak, but luckily heading a bit further north revealed plenty of color still on the branches. The first location that I really got excited to take out my camera was at Kent Pond in Killington, across the road from Gifford Woods State Park. The water in this 100 acre pond was completely still to make for a perfect reflection of colorful foliage and sky in my compositions. Continuing north on Rte 100 I kept seeing numerous barns and photo worthy scenes, but there wasn’t always an easy place to pull over. Luckily there were a few spots that allowed me to try for some shots with barns in front of a colorful patchwork backdrop. I decided to stop at Moss Glen Falls in Granville, a gorgeous horsetail waterfall directly on Rte 100, to get some long exposure shots. I had previously photographed these falls in February when I adventured up to these parts with a group of fellow Connecticut photographers for a long weekend. Was fun to attempt getting a similarly framed shot from both seasons to show the extreme contrast of vibes between the two. Decided to send up my drone along this stretch of road to get a bird’s eye view of the winding Route 100 through a colorful palette of greens, yellows, oranges & reds. It’s an amazing complimentary tool to have when you just can’t get to a spot for the perspective you are trying to capture, and with the compact size there’s no reason to not always have with me. Once I packed up the drone I began the ride back an hour south to the Ludlow area where I was staying for the night. A few photographer buddies from Connecticut were making their way up and met me at the hotel to crash for the night after grabbing some dinner. The next morning we started early and stopped at the Taftsville Covered Bridge in Woodstock to snap some shots to start the day. After firing off a few frames with my trusty Canon 6D I noticed a black diagonal bar across my images on the back screen. After opening up the camera I saw that a shutter blade had broke and was covering part of the sensor. It wasn’t anything that I could fix so that camera would be unusable for the rest of the trip and have to get sent into Canon for repair after I got back home. That’s why I always have a backup camera body (Canon 7D mark II) with me in case of an emergency like this and still be able to shoot on the rest of the trip. 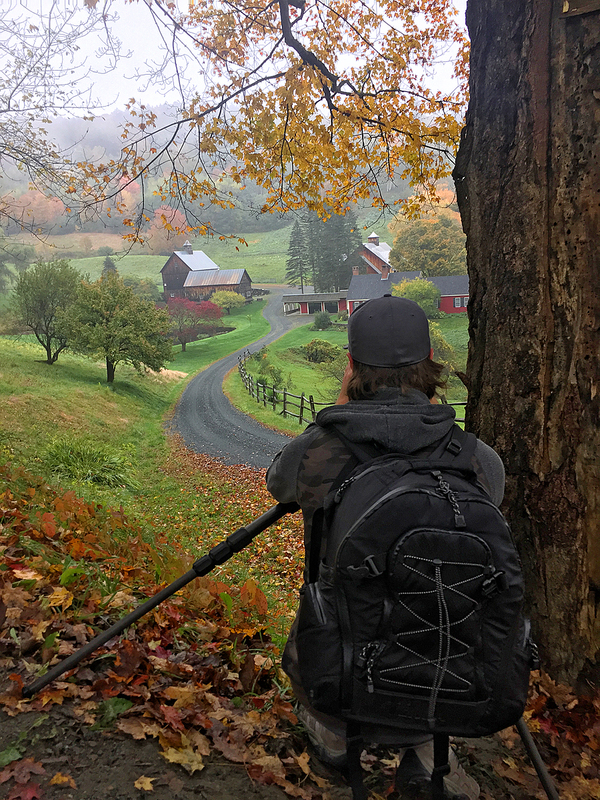 We then made our way towards Pomfret for our main target of the morning at the iconic Sleepy Hollow Farm, once owned by Aerosmith guitarist Joe Perry. This picturesque gated property includes a winding driveway leading down to a red farmhouse, rustic barn, pond, and rolling backdrop of fall foliage. It was a misty foggy morning which only enhanced the vibe of the scene and made the colors even richer. After leaving the farm we headed north on Cloudland Road and came across this badass vintage VW bus parked on the lawn of a house. 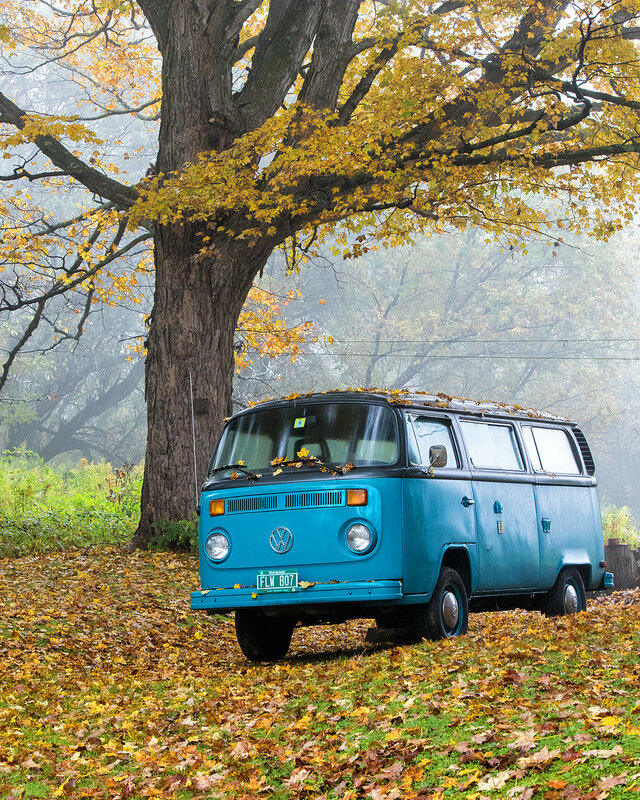 Had to stop to capture this scene complete with golden foliage and foggy background to make for an amazing image. Finding these hidden back road gems is what sometimes makes dirt road driving a very rewarding experience and always worth the extra time. Continuing north this dirt road turns into the winding Galaxy Hill Road and provided another perfect composition. 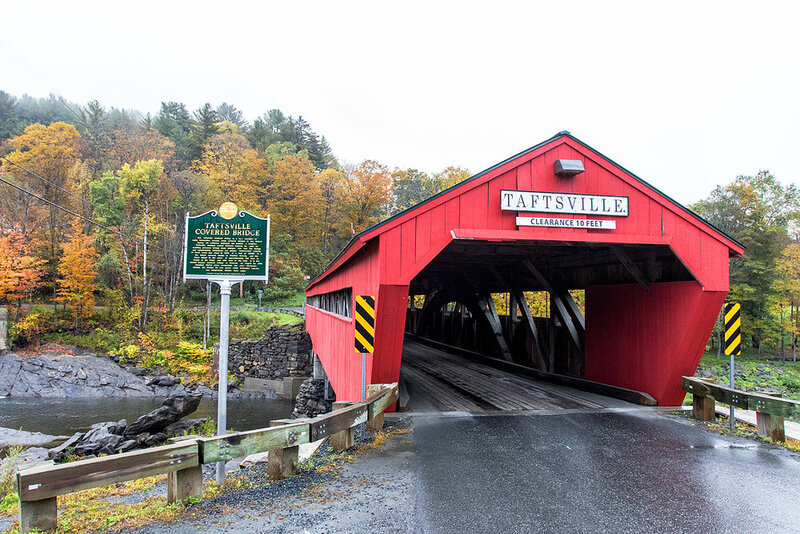 Our next stop was Woodstock, featuring the quintessential New England downtown area and covered bridge, where we walked around for a bit with our cameras seeing what scenes caught our attention. The Middle Covered Bridge right downtown, that was built in 1969 to replace the original iron bridge that had been there since 1877, made for a great composition and I even posted for a quick portrait inside of it. The next stop was another iconic location in 15 minutes south in Reading just off of Route 106. 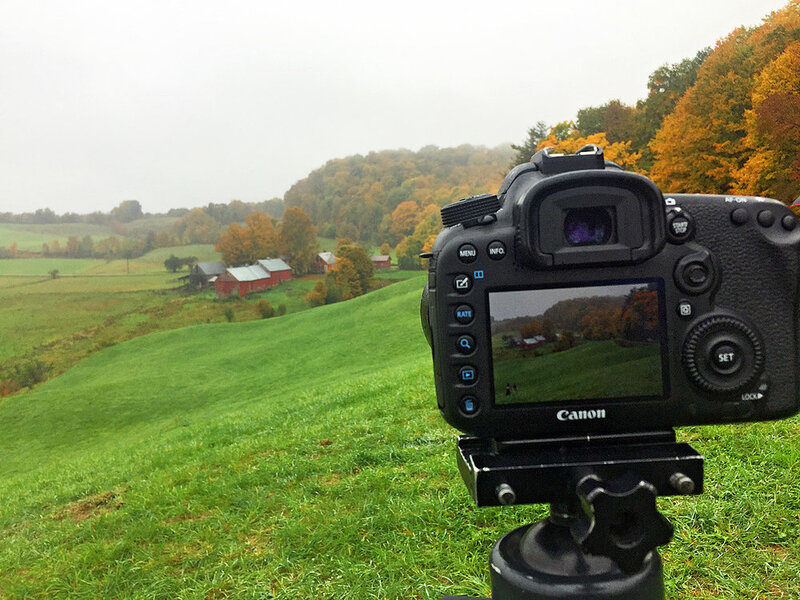 The scenic vista at Jenne Farm was discovered over 60 years ago by a local photography school in South Woodstock and has since appeared on numerous magazine covers, books & even a Budweiser TV commercial. The most notable appearance of this picturesque New England location was in the movie Forrest Gump, as he's running across the country and heads down the dirt road pictured here to the right of the farm. Our final stop in central Vermont was the Quechee Gorge in the town of Hartford, aptly dubbed “Vermont’s Little Grand Canyon”. Some 13,000 years ago, during the Ice Age, Quechee, like the majority of our continent, was covered by a glacier. As the glacier receded from the ocean waters, the melting waters slowly and steadily cut away the bedrock ridge that has become Vermont’s most spectacular natural wonder. Standing 168 feet above the Ottaquechee River you can view the waterfalls on both side of the road and with such a narrow walking path I had to squeeze my tripod legs so close together in order to fit. It was an amazing quick trip putting some miles on the car driving through a beautiful region of New England and I’m excited to be heading to the White Mountains next weekend for more fall foliage hunting.